View our video message taped July 2005 after my first journey into Israel Palestine. For thirty years, the United Nations has called for a Nuclear Weapons Free Zone in the Middle East. The 2010 Nuclear Non-Proliferation Treaty Review Conference unanimously called for an international conference to begin discussing a zone free of nuclear weapons and other weapons of mass destruction in the Middle East. The proposed Conference is scheduled for mid- December, 2012, in Helsinki, Finland. BE IT RESOLVED, that we call upon Congress to immediately investigate the attack on the USS Liberty that was perpetrated by the armed forces of the State of Israel on June 8, 1967, in order to determine the truth behind the attack, and bring closure to the families and crew. "The Peace of the World begins in Jerusalem." Rev. Theodore Hessburgh, president emeritus of the University of Notre Dame, spoke those words at the end of my first 16 Days in Israel Palestine in 2005. In pursuit of that goal, I founded my website WeAreWideAwake.org three weeks after that first of seven trips to the Holy Land. The greatest menace to freedom is an inert people. In his State of the Union speech, President Obama equated nuclear power, coal and natural gas with "clean" energy. In fact, toxic radiation is emitted daily from every nuclear reactor and other commercial nuclear facilities and "clean coal" is an oxymoron. Please learn more and help educate Congress, that Nuclear Energy is Dirty Energy. In his State of the Union address, President Obama made the unfortunate mistake of equating nuclear power with "clean" energy. This is simply not the case. Yet I understand there will be legislative proposals this Congress to include nuclear power (and dirty coal as well) in a "Clean Energy Standard." Proposals to include nuclear power as part of a Clean Energy Standard suffer from three fundamental misconceptions: 1) that carbon dioxide is the only pollutant that matters when defining “clean energy;” 2) that because radiation is invisible and odorless, it is not a toxic pollutant; 3) that nuclear power is carbon-free. None of these is true. Including nuclear power and coal in a "clean energy standard" might reward big business--which surely needs no more taxpayer support--but it would make a mockery of the entire concept. Please inform me of what you will do to ensure that a "clean energy standard" that includes nuclear power and coal is not passed by the Senate. On April 21, 2004, upon his release from 18 years in Israeli jail for providing the photos that proved that Israel had upwards of 200 nuclear warheads, Mordechai Vanunu said: "I am not harming Israel. I am not interested in Israel. I want to tell you something very important. I suffered here 18 years because I am a Christian, because I was baptised into Christianity. If I was a Jew I wouldn't have all this suffering here in isolation for 18 years. Only because I was a Christian man." "They renewed the restrictions to not speak to foreigners until November. "I meet foreigners every day. I am talking with people every day. "But I am not writing or announcing the appeal until after it happens. "It was scheduled for January, then May 6th and June 18th. Now I am waiting for a new court date. "The Central Commander of the General Army testified in court that it is OK if I speak in public as long as I do not talk about nuclear weapons. "I think the court will realize even if they send me back for three months-what will they do after that? "It is all about freedom of speech." Please also email Israeli Supreme Court President Dorit Beinish who has continued to deny Vanunu the right to leave the state. On July 6, 2009, in regards to Mordechai Vanunu, you stated that his "case is still generating great interest, like any other security-related case. The media's attention he gets is proof of that." The "great interest" is for Vanunu's RIGHT to free speech and RIGHT to leave the state. "You have freedom of speech and freedom of movement. Do what you want. But I am not publishing anything. Everything is already on the Internet." 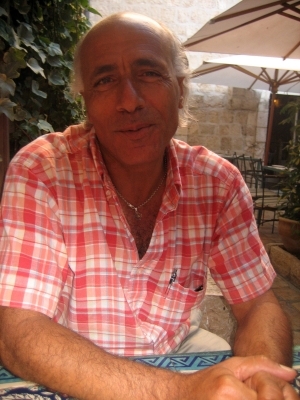 On January 25, 2006 Mordechai Vanunu was convicted by the Jerusalem Magistrates Court of 15 violations of a military order that prohibited him from talking to non-Israelis and because he supposedly attempted to leave Israel by taking a cab to go from Jerusalem to Bethlehem to attend Christmas Eve mass at the Church of the Nativity in 2004. The original indictment included 22 different violations, Vanunu was charged with 19 and acquitted of four. He was acquitted of speaking to foreign nationals on the internet and via video and voice chats. Vanunu was convicted just for speaking to non-Israeli media, and not on the content of the conversations that began the day he emerged from 18 years in prison-most all of it in solitary- for providing the photographic proof in 1986 of Israel’s underground WMD facility. Nuclear experts hired by the London Sunday Times, interviewed Vanunu and determined that Israel had already manufactured upwards of 200 nuclear warheads by the time Vanunu last set foot in the Dimona, twenty-three years ago. On July 2, 2007, Israel sentenced Vanunu to six months in jail for speaking to foreigners-who happened to be media-in 2004. Two days before President Bush’s first trip to Israel, and a day before Vanunu’s appeal was to begin, Israel sentenced him to community service. But Israel does not recognize East Jerusalem as part of the community, and although it is the only neighborhood that Vanunu has lived since April 21, 2004, Israel denied Vanunu the right to serve the sentence in his neighborhood. The UN Universal Declaration of Human Rights is binding on "all countries of the world". The statehood of Israel was contingent upon upholding it. EQUAL human rights are declared as UNDERSTOOD at the outset of the document as "inalienable" and therefore can not be denied by any government. As a person of conscience, I am asking you to lead Israel to be merciful and just towards Vanunu and encourage them to drop the 3 month jail sentence against him for speaking to foreigners in 2004; who happened to be media. "Everyone has the right to freedom of opinion and expression; this right includes freedom to hold opinions without interference and to seek, receive and impart information and ideas through any media and regardless of frontiers." -Article 19. As a person of conscience, I am asking you to do all in your power to help Mordechai Vanunu receive his inalienable human rights. As a person of conscience, I am also asking you to be a true friend to Israel. As a person of hope, I look forward with gratitude that you as a person of conscience will do something. Author "Keep Hope Alive" "Memoirs of a Nice Irish American 'Girl's' Life in Occupied Territory"
PHONE LINES are only open 9-5 PM EST. Since his release from jail April 21, 2004, Mordecahi Vanunu has been denied the RIGHT to leave Israel and denied the RIGHT to speak to non-Israelis. As a person of conscience I request you do everything in your power to obtain justice for Vanunu: release to full freedom. Everyone has the right to freedom of opinion and expression; this right includes freedom to hold opinions without interference and to seek, receive and impart information and ideas through any media and regardless of frontiers. -Article 19. Congratulations on your historic election as the next President of the United States. Last year, you pledged to “take an active role, and make a personal commitment to do all I can to advance the cause of [Israeli-Palestinian] peace from the start of my Administration.” We are eager to work with you to fulfill this goal. To do so, your Administration should break with past policies of unconditional support for Israel's illegal military occupation of the Palestinian West Bank, East Jerusalem, and Gaza Strip, and change U.S. policy toward Israel/Palestine to support human rights, international law, and equality. * Insist that Israel ends its siege of the Gaza Strip. Israel has deliberately impoverished the 1.5 million residents of the Gaza Strip and caused a humanitarian catastrophe of dire proportions by prohibiting the delivery of food, medicine, fuel, and electricity. Your Administration should insist on the illegality of collective punishment and support the human rights of Palestinians such as freedom of movement as a first step towards ending Israel's occupation of the Gaza Strip. * Hold Israel accountable for its misuse of U.S. weapons. In 2007, the United States and Israel agreed to increase military aid to Israel by 25% over the next decade, totaling $30 billion. During the Bush Administration, Israel killed more than 2,000 innocent Palestinian civilians who took no part in hostilities, oftentimes with U.S. weapons in violation of the Arms Export Control and Foreign Assistance Acts. Your Administration should hold Israel accountable for these violations of U.S. law and cut off military aid as required by law, rather than increase it. * End the U.S. veto protecting Israel at the United Nations. The United States has used its veto power at the UN more than 40 times since 1972 to shield Israel from the consequences of its violations of human rights, UN resolutions, and international law. Your Administration should work with, not in opposition to, the international community so that human rights, UN resolutions, and international law are applied and enforced uniformly. * Base a just peace on human rights, international law, and equality. Such a policy is the only way to ensure the legitimate security needs of all peoples and can only be achieved by engaging in dialog with all interested parties. 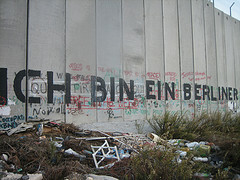 A just and lasting Israeli-Palestinian peace includes the complete end of Israel's military occupation of the West Bank, East Jerusalem, and Gaza Strip; a resolution to the Palestinian refugee issue consistent with international law and UN resolutions, including the right of return and/or compensation; and full equality for Palestinian citizens of Israel. A policy denying Palestinians these internationally-guaranteed rights will only lead to yet another failed “peace process”. Where are they on Gaza, Jerusalem, the rights of refugees, The Wall, the continuing settlements, the over 500 checkpoints that deny the indigenous people of that land the right to access their land, jobs and holy sites in light of this year; the 60th anniversary of Israel and the UN Universal Declaration of Human Rights- upon which Israel's statehood was contingent upon upholding. Just hours after U.S. Secretary of State Condoleezza Rice left the region for the second time, Israel announced plans for 1,400 new homes on Palestinian land. Jerusalem's city hall announced it will build 600 new apartments in Pisgat Zeev, a Jewish "neighborhood" in the eastern sector of the city and a place I visited in 2006. Pisgat Zeev is an Orwellian Disney World of swimming pools, playgrounds and lush landscape less than a five minute drive from Anata, refugee camp, where The Wall is butted up to the boy's high school. The playground for Anata is a slab of cement at the high school about the square footage of a basketball court. One of the resident refugees told me, "The Israeli forces show up when the children gather in the morning or after classes. They throw percussion bombs or gas bombs into the school nearly every day. The world is sleeping; the world is hibernating and allowing this misery to continue." "Neighborhood" is a euphemism for settlement. 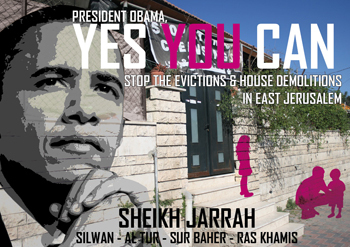 Every settlement in the West Bank is illegal under international law. On March 31, 2008, Israel began taking down some of the 50 West Bank roadblocks it pledged to remove during Rice's visit. Israel still maintains more than 500 checkpoints and roadblocks, claiming "security" - euphemism for total control of the indigenous people's right to move and export their goods; another reason the Palestinian economy is in ruins. The policies the United States has pursued since the Six Day War have failed to achieve security for Israel and have been an injustice unto Palestinians. All we the people hear from our politicians is the same failure to lead in the way of equal human rights and international law. All we the people hear is an increasingly fervent repetition of the status quo and bankrupt policies that have brought us to this point in time where 'civilized' people consider-some even relish-the thought of unleashing the terror of another nuclear bomb. On January 23, 2008, Senator Obama sent a letter to Zalmay Khalilzad, U.S. Ambassador to the United Nations, about a proposed Security Council resolution on the situation in Gaza. Obama focused on condemning Palestinian rocket attacks against Israel, but made no mention of the ongoing Israeli bombardments and raids that have killed hundreds of innocent residents of Gaza, as well as the calculated Israeli policy of denying the necessities of life - food, clean drinking water, medicines, medical care, school supplies, and the energy needed to power sewage treatment plants and hospital operating rooms - to the 1.5 million open air prisoners, of whom more than half are children. Obama wrote that "Israel is forced to do this." Obama denounced Hamas as a terrorist organization, but ignored its repeated offers of a long-term truce with Israel - offers the Israeli government has repeatedly immediately rejected, although polls show that more than 60 percent of Israel's own population favors negotiations with Hamas. Not Obama, not McCain and not Clinton have offered even a word of criticism of Israel, or of sympathy for the people of Gaza. This is not "change we can believe in" and what we the people need is the chance to begin the world again. This time we do have it in our power to begin the world again, but we need the media to ask the questions we the people of America must have answers to. Where are the candidates on Gaza, Jerusalem, the rights of refugees, The Wall, the continuing settlements, the over 500 checkpoints that deny the indigenous people of that land the right to access their land, jobs and holy sites in light of this year; the 60th anniversary of Israel and the UN Universal Declaration of Human Rights- upon which Israel's statehood was contingent upon upholding. Having witnessed life in occupied Palestine, I attest that Military Occupation dehumanizes the occupied and will reap many without hope. Only a person without hope that things will improve could even consider strapping on a bomb and killing themselves. We the people in the land of the free and home of the brave, actually have some power before we elect another president who will maintain the status quo. Yeah, we can. We can do that, we can elect a politician beholden to the Military Industrial Complex, corporate interests, the religious right and lobbyists, or we can say, no, not this time. Might this time we the people see with eyes of the dissidents, rebels and revolutionaries who founded these United States. Might this time we see the world is our country and that all men and women are our sisters and brothers. Might this time our leaders seek to do good and be merciful and just. Might this time our media ask the questions too many of we the people, do not even know must be asked. Might this time our politicians be beholden to we the people and not to any foreign power. Washington, DC…Sixteen national religious organizations filed formal public comments today opposing the administration's plans to build a new nuclear bomb plant that would be wasteful, unneeded, and dangerous, the Friends Committee on National Legislation (Quakers) announced today. The hearing is one of a series of public events the Energy Department is holding to assess the environmental impact of Complex Transformation, the proposed plan to rebuild the U.S. nuclear weapons complex. The centerpiece of this proposal is a new nuclear weapons plant for the production of plutonium pits, the primary detonators in modern nuclear weapons. The Los Alamos National Laboratory, located 25 miles northwest of Santa Fe, NM, is the site slated for the new bomb plant. The religious groups express concern that the facility would be used to develop a new generation of nuclear warheads, despite the moral and legal obligations of the United States to reduce its weapons arsenal. As Americans who will be voting in this year's presidential elections, we have welcomed your focus on the need for new thinking about America's role in the world and your insistence that peace and security depend on respect for international law and for the rights, dignity, and common humanity of all peoples. Surely one of the areas where it is most critical to apply these values is Israel/Palestine, where the policies the United States has pursued for 40 years have brought about neither peace nor justice. We have hoped you would articulate a new approach to this issue, one built on respect for the rights of the Palestinians as well as the Israelis. Unfortunately, all we have heard from you so far on this issue is an increasingly fervent repetition of the same bankrupt policies pursued by George W. Bush and his predecessors. 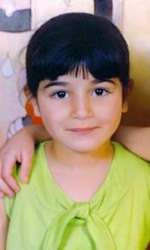 In particular, we were shocked to read your letter of January 23, 2008, to Zalmay Khalilzad, U.S. Ambassador to the United Nations, about a proposed Security Council resolution on the situation in Gaza. In it you focused on condemning Palestinian rocket attacks against Israel, but made no mention of the ongoing Israeli bombardments and raids that have killed hundreds of innocent residents of Gaza, as well as the calculated Israeli policy of denying the necessities of life - food, clean drinking water, medicines, medical care, school supplies, and the energy needed to power sewage treatment plants and hospital operating rooms - to all 1.5 million residents of the area, of whom more than half are children. When you say that "Israel is forced to do this," we hope that you are not condoning or encouraging Israeli human rights violations. You denounce Hamas as a terrorist organization, but ignore its repeated offers of a long-term truce with Israel - offers the Israeli government has summarily rejected, even though polls show that more 60 percent of Israel's own population favor negotiations with Hamas. The brutal and disproportionate nature of Israel's recent actions in Gaza has been condemned around the world, including by UN Secretary General Ban Ki-moon and by the European Union. Yet you, like Hillary Clinton and John McCain, have offered not a word of criticism of Israel, nor of sympathy for the people of Gaza. This is not "change we can believe in." We understand that you are under intense political pressure by those who consider themselves pro-Israel. But as your campaign leaflets say, "What this country needs is a President who won't just do what's right when the politics are easy, but will stand up when the politics are hard." This is a time to show you mean that. We call on you to condemn the Israeli assault on Gaza and to outline a new policy on Israel/Palestine based on respect for international law and the rights and dignity of the Palestinian as well as the Israeli people. It is the PEACEMAKERS who are the children of God, NOT those that bomb, torture and occupy others! My December 27, 2007 FAXES to the empire and may they inspire you to FAX too. In paraphrase of Paul Revere, "The Americans are coming, the Americans are coming, the real Americans are in your face and we will not be silenced!" The USS LIBERTY Veterans Association have for decades been seeking an open and transparent Congressional investigation so that the survivors of the brutal attack on the unarmed spy ship, the USS LIBERTY can be questioned in an open and fair hearing; which is in the best interests of America, but NOT Israel, which is not a democracy, but an ethnocracy and apartheid regime. As a Senator, you have sworn an oath of loyalty to America to protect and serve this country; not to protect and serve Israel! There has NEVER been a Congressional investigation to that day in infamy when LBJ said, "I don't give a damn about a few sailors. I will not embarrass an ally." This civilian journalist and patriotic American will not be silent and will do all I can to embarrass a limp supine Congress who are beholden to AIPAC and are no allies to our Vets or we the people of America. “Never before in the history of the United States Navy has a Navy Board of Inquiry ignored the testimony of American military eyewitnesses and taken on faith the word of their attackers.”–Dr. Richard Kiepfer, Capt. USN ret. and USS Liberty survivor. This civilian journalist is supporting the troops by listening to America's heroes; the survivors of the USS LIBERTY and I am reporting all on the World Wide Web. As God is my witness, I will NOT be silent and I am in pursuit of the second American Revolution! If you want to keep power, may you gain some COMMON SENSE! Enormously positive PR for Israel and America can be reaped by releasing Mordechai Vanunu to freedom from captivity to coincide with President Bush's upcoming visit to the Holy Land and Vanunu's January 8, 2008 freedom of speech appeal. 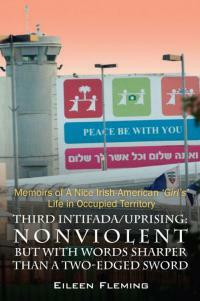 In my second book, MEMOIRS OF A NICE IRISH- AMERICAN 'GIRL'S' LIFE IN OCCUPIED TERRITORY, I likened Vanunu to the prophet Jeremiah, who also endured years of house arrest in Jerusalem for speaking truth to power. Prophets do not necessarily predict the future, but they do point out impending doom and are not appreciated or accepted by their own. If Israel insists on sending Vanunu back to jail, I will not be silent. 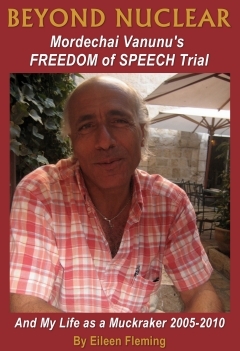 I will turn Vanunu into a martyr for freedom of thought, speech and religious apartheid. In Solidarity with Micah 6:8 and in the words of the IDF to me at every checkpoint: "Have a nice day." I have been writing letters to our elected officials for the past 20 years, trying to get a congressional investigation into the deliberate attack on the USS LIBERTY on June 8, 1967 by the government of Israel. This atrocity and cold-blooded murder of America’s sons on the high seas was an act of war against the United States of America, not to mention the numerous war crimes committed against the crew of the USS LIBERTY. Being that this is America where there exists at least a small shred of freedom, including freedom of speech and the right of redress to our government, let me speak to you then like an American, and as you read this, remember something, you asked for it. A great man once said ‘What you sow also shall you reap,’ and with that in mind what you are about to hear from me–which mirrors the thoughts and feelings of not only my fellow crew members but also a good portion of the American people, is a badge that you have earned by your own actions, so wear it with pride. You, our elected officials, are in truth nothing but a bunch of stooges and front men for the government of Israel. Whatever Israel wants, Israel gets, no matter what. If you don’t follow their every want and need you won’t be in congress very long and you damned-well know it. The power the Israeli Lobby has over you is only slightly less sickening than what is your willingness to bow to their every damned demand. You are as guilty of murdering my shipmates as the Israelis are. You have their blood on your hands because you continue to cover up the truth concerning what happened to them. In a better time in America’s history, that would be considered treason, every bit as much as Benedict Arnold attempting to turn over West Point to the British during our own war for freedom. Were you ordinary people and not members of the US Congress your crimes would be considered accessory to murder and you would be put away for life. You took an oath to protect and serve and honor the Constitution of the United States, not to serve Israel, and yet you serve the Jewish state rather than your own nation and even when you know it’s wrong. They are your masters and always will be until you get some backbone and say ‘enough already’. The USS LIBERTY Veterans Association wants a Congressional investigation so that we–the survivors of the nearly-2-hour attack–can be questioned in an open and fair hearing. If an American ship were attacked by any other country, and especially by one of those other Middle Eastern countries that are on Israel’s hit-list, you know full-well that there would be investigations coming out our ears to the point where no other business in Congress would be taking place. Is this–a proper investigation into an act of war perpetrated against the people of the United States–to ask of our elected members of Congress who swore an oath of loyalty to the US by combat wounded veterans who swore an oath to protect and serve this country? Many gave their lives doing just that. But we know what is really going on here, don’t we now, Mr. or Mz. Congressperson? We all know why a proper investigation cannot be allowed to take place, which is that the truth will overcome the mountain of lies that Israel has vomited out these 40 years about the attack being a case of ‘mistaken identity’, and we all know what would happen once the American people found out the truth, which is that Israel would be cut off from Uncle Sam’s generous bank account, or worse. Thank you for your letter regarding the 1967 attack on the U.S.S. Liberty. I appreciate hearing from you. Multiple investigations have concluded that the Israeli forces who attacked the ship mistook it for an Egyptian vessel. The Israeli and U.S. governments closed the case in 1987, and the Israeli government has paid more that $13 million in reparations. At this time, I do not think an additional investigation is necessary. This was the standard form letter all of you send out to the survivors and the public. In fact, there has been only one investigation through the Board of Inquiry, which was a sham and cover-up for Israel. Look in the congressional record, senator, and show me where and when all of these ‘investigations’ took place. You can’t, and for one simple reason–THERE NEVER HAS BEEN ANY, NOT ONE. What you wrote me was a bold face lie and what that makes you sir is a liar, despite your undeserved title of ‘Honorable’. The proof of this is that a letter was sent from the Department of the Navy in response to an inquiry by Congressman Robert Simmons from Connecticut. His inquiry was made on March 16, 2005 and it clearly states that the Navy’s 5-day sham investigation is the ONLY investigation ever made by the U.S. Government, period! Check with your colleague for verification. One of the men who signed off on the Board of Inquiry, Captain Ward Boston, has recently come forward and said the Board of Inquiry was a lie which he was ordered to produce. That order came from none other than Admiral John S. McCain, Jr, Senator McCain’s father and the inquiry that should have lasted at least 6 months by Navy standards took less than ten days. The money Israel paid our government for the attack was given to them by the U.S. Israel was out nothing, not one a dime. The ship alone was worth $40 million, for God’s sake. Don’t you think that this alone is proof of the US being short-changed? But then, this is what always happens when you deal with Israel, and what we don’t give her willingly she steals by spying. Case in point, Jonathan Pollard, and who knows how many others. By the way, Senator Salazar, in your letter you did not even mention a word about the men murdered that day or the wounded, nor did you say a kind word to their families for the heartaches they have endured these last 40 years. That in itself is disgusting and disrespectful towards the men and women who wear the uniform of the U.S. military. Shame on you. You won’t honor our fallen heroes, you could care less. I can say one thing for certain though, which is that had you been there that day and experienced what we experienced or had you lost a son or brother as a result of ‘our friend’ Israel, you would not be so quick to give her a clean bill of health. To all of you in Congress, once the American public finds out that you have been covering up for the government of Israel and our government, you will all be looking for new jobs, and that is putting it mildly. Nobody wants a bunch of flunkies and liars working for them and never before in the history of any nation have there been as many flunkies and liars than the US Congress today. What better words define and describe the disloyal and treasonous government officials, who on June 8, 1967 allowed over 200 American sailors on the unarmed U.S.S. Liberty to be murdered and wounded in broad daylight in international waters in what was a deliberate attack by Israeli aircraft and torpedo boats? Incredibly, these same subservient public officials, apparently owing their allegiance to a foreign entity, collaborated to protect a guilty Israel from public condemnation and punishment by manipulating and relegating the bloody massacre into a political black hole for four decades. President Lyndon B. Johnson and Sec of Defense Robert McNamara qualified as co-perpetrators in treason by ordering and executing the pull back of American aircraft responding to desperate calls from the helpless Liberty crew, and permitting the massacre to continue. Finally, the co-conspirators initiated and orchestrated a criminal cover up that remains in place to this day. Every one of the faceless, gutless government officials and bureaucrats who know the truth and dare not to act or speak out. To date Congress has fearfully evaded and defaulted on its oversight responsibility to conduct an independent and open investigation to expose the truth of the deliberate and unprovoked attack on the U.S.S. Liberty by Israel. In fact, no investigation has ever been held at any level of government to investigate the Israeli treachery. Israeli political actions committees paid off and threatened members of Congress well for the pass - approximately $3,300,000.00 in the latest 2005-2006 election cycle, and over $50,000,000.00 since 1978. Of course a grateful Congress has reciprocated, having given lavishly to the Mideast mini state over $100,000,000,000.00 of U.S. taxpayers’ money. A return on investment that would put Warren Buffet to shame. Enough! Phillip F. Tourney, survivor of the Israeli attack on the USS Liberty is a hero and a friend of mine. Winter Soldiers, according to founding father Thomas Paine, are the people who stand up for the soul of their country, even in its darkest hours. Mark Wilkerson went to Iraq a true believer: He supported the president, the war, and the troops he was fighting with. But what he saw on the ground forced him to question everything he'd ever known—and to decide he'd never go back. * Full benefits, adequate healthcare (including mental health), and other supports for returning servicemen and women. This spring, Iraq Veterans Against the War (IVAW) is revealing the reality of the U.S. occupation of Iraq and Afghanistan. In what will be history's largest gathering of U.S. veterans who served in Iraq and Afghanistan, as well as Iraqi and Afghan survivors, eyewitnesses will share their experiences in a public investigation called Winter Soldier: Iraq and Afghanistan. Truth, honesty and integrity are essential components to a functioning democracy. Concerned veterans are taking it upon themselves to make their available to everyone who cares about the direction of our country. Soldiers and Marines are not to blame for the suffering of the people of Iraq and Afghanistan, these veterans stories will indicate that responsibility belongs to those in the seat of power and the problem goes much deeper than the atrocities of Abu Ghraib and Haditha. This public investigation will be called the Winter Soldier: Iraq and Afghanistan. Winter Soldiers, according to founding father Thomas Paine, are the people who stand up for the soul of their country, even in its darkest hours. The lives of millions of people depend on Americans having informed opinions and acting in accordance to their principles. The lives of thousand service members and civilians depend on you being a Winter Soldier. Despite the unfolding tragedy in Iraq and the dangerously spiraling crises in the Middle East, another war of an unprecedented scale, this time against Iran, is looming. The environmental and human cost of this war would, by comparison, dwarf the suffering in Iraq; it would engulf the region and have serious and unforeseen global consequences. Terrifyingly, even "pre-emptive" nuclear strikes on Iran have not been ruled out. The introduction of the notion of limited "surgical strikes" involving tactical nuclear bunker busters, has not only increased such possibility, it has brought the morally unthinkable into the realm of debatable. By the introduction of the idea itself, it has begun the process of desensitising the public to such a horror. The logical outcome of the nuclear threat is undoubtedly a drive to nuclear proliferation in the region, which would then increase the likelihood of its eventual use. In this eventuality, there will be no winners. At this perilous time, let us be reminded of the joint Manifesto by Bertrand Russell and Albert Einstein of July 1955, at the height of the Cold War: "We are speaking on this occasion, not as members of this or that nation, continent, or creed, but as human beings, members of the species, Man, whose continued existence is in doubt ... We shall try to say no single word which should appeal to one group rather than to another. All, equally, are in peril, and, if the peril is understood, there is hope that they may collectively avert it. ... The question we have to ask ourselves is: what steps can be taken to prevent a military conflict of which the issue must be disastrous to all species?" The stakes now are at least equally high. It is with this same spirit of shared humanity that we reach out to all peace loving people in the world to subscribe to the following steps to reduce the risk of a nuclear confrontation. 1. Call for the Middle East to be a zone free from nuclear and other weapons of mass destruction. 2. Call upon Israel, as the only Middle Eastern state suspected of possession of nuclear weapons, to join the nuclear Non-Proliferation Treaty and become fully transparent by opening its clandestine nuclear facilities to international inspections and supervision by International Atomic Energy Agency. Any nuclear weapons or programme and facility in abrogation of the guidelines of the NPT to be dismantled and removed. 3. Call for the dispute about Iran’s nuclear programme, to be resolved through peaceful means, through negotiations and dialogue with the representatives of the International Atomic Energy Agency, and through such measures deemed necessary by the IAEA, in accordance with the guidelines of the nuclear Non-Proliferation Treaty, of which Iran is a current signatory. 4. Welcome Iran’s declaration of the peaceful nature of its nuclear programme, but urge Iran’s full co-operation with the International Atomic Energy Agency to avoid suspicion and misunderstanding. 5. Strongly condemn the Israeli government for its continued harassment, conviction and now prison sentence imposed on Mordechai Vanunu, for simply talking to foreign journalists. We call upon the Israeli authorities to lift all restrictions on Vanunu and allow him to go free. Jewish, Christian and Muslim leaders, members of the Council of Religious Institutions of the Holy Land, were in Washington last week to meet with U.S. lawmakers and their American co-religionists to express their shared commitment to work for peace. In a public statement (included in full below along with a list of the Council members) the clerics pledged to "find the right way to live together in peace" and promised cooperation related to the Holy Sites that "respects their integrity and independence and avoids any act of desecration, aggression or harm." On the issue of Jerusalem the leaders said they will "work to secure open access to the Old City for all communities, and seek a common vision for this city which all of us regard as holy." The initiative was funded by a grant from the US Agency of International Development and is based on the efforts of Secretary of State Condoleezza Rice to foster new and creative ways to build trust and strengthen respect among communities in the region. Cardinal McCarrick and Amb. Tony Hall were instrumental in arranging their visit and meetings. The Council members met with Sec. Rice when she was in the region in October, and during their visit to Washington with C. David Welch, Assistant Secretary of State for Near Eastern Affairs as well as members of the U.S. Senate and House of Representatives. Churches for Middle East Peace board and staff attended a reception with the Jewish, Christian and Muslim religious leaders from the Holy Land. Also last week, the U.S. National Interreligious Leadership Initiative (NILI) released a letter to Undersecretary of State for Political Affairs Nicholas Burns ahead of their meeting on November 9. This was the fourth in a series of State Department meeting for the group this year. Among the 36 religious leaders endorsing the letter are: Theodore Cardinal McCarrick, Archdiocese of Washington; Most Rev. William Cardinal Keeler, Archbishop of Baltimore; Most Rev. William Skylstad, President of the US Conference of Catholic Bishops; Archbishop Demetrios of the Greek Orthodox Church; Archbishop Khajag Barsamian of the Armenian Orthodox Church; Presiding Bishop Mark Hanson, ELCA; Presiding Bishop Katharine Jefferts Schori, Episcopal Church; John H. Thomas, President, United Church of Christ; Rev. Dr. Sharon Watkins, President, Christian Church (Disciples of Christ); The Rev. Clifton Kirkpatrick, State Clerk, PCUSA; Bishop Ann B. Sherer, United Methodist Church; The Rev. Michael Livingston, President, National Council of Churches. Encourage Interreligious Dialogue and Cooperation in Your Community: Share the Holy Land Council Communiqué and the NILI letter with Jewish and Muslim religious leaders and individuals in your community. Links to the statements in PDF format for easy printing are below. Call your Rep. to Support Ackerman-Boustany Letter: The letter closes this Friday, Nov. 16th and currently has 89 signers. Your calls tomorrow, Nov 13th, together with members of collegial Jewish and Arab-American organizations, will send a strong message of support for peacemaking. The Capitol Switchboard is 202-224-3121. Ask your Rep. to support the upcoming Annapolis meeting by signing on to the Ackerman- Boustany letter. See CMEP's Oct 22nd action alert for further advocacy guidance. This is a public statement from the Heads of Communities and Institutions of the three monotheistic religions in the Holy Land released on November 7th during several days of meetings in Washington, DC. All of us believe in one Creator and Guide of the Universe. We believe that the essence of religion is to worship Him and respect the life and dignity of all human beings, regardless of religion, nationality and gender. We accordingly commit ourselves to using our positions of leadership, and the influence of our good offices, to advance these sacred values, to prevent religion from being used as a source of conflict, and instead serve the goals of just and comprehensive peace and reconciliation. Our respective Holy Places have become a major element in our conflict. We lament that this is the case, as our respective attachments to our holy places should not be a cause of bloodshed, let alone be sites of violence or other expressions of hatred. Holy places must remain dedicated to prayer and worship only, places where believers have free access and put themselves in the presence of the Creator. Holy places are there for believers to draw inspiration to strengthen their acceptance and love of Almighty and all His creatures, from all religions and all nationalities. Accordingly each religious community should treat the Holy Sites of the other faiths in a manner that respects their integrity and independence and avoids any act of desecration, aggression or harm. We, believers from three religions, have been placed in this land, Jews, Christians and Muslims. It is our responsibility to find the right way to live together in peace rather than to fight and kill one other. Palestinians yearn for the end to occupation and for what they see as their inalienable rights. Israelis long for the day when they can live in personal and national security. Together we must find ways of reaching these goals. 1. Establish "hot line" procedures of rapid communication among ourselves in order to address and advise government officials regarding issues of protection of and access to Holy Sites before such issues become cause for conflict. 2. Establish mechanisms to monitor media for derogatory representations of any religion, and issue statements in response to such representations. 3. Together reflect on the future of Jerusalem, support the designation of the Old City of Jerusalem as a World Heritage Site, work to secure open access to the Old City for all communities, and seek a common vision for this city which all of us regard as holy. 4. Promote education for mutual respect and acceptance in schools and in the media. We will sponsor a conference for Israeli and Palestinian educators, academics and Ministers of Education on "The Role of Religion in Educating for Peace: Principles and Practices." 5. Demonstrate through our relations that differences can and should be addressed through dialogue rather than through violence, and strive to bring this message to our respective communities and political leaders that they may embrace this approach accordingly. 6. Provide ongoing consultation to our government leaders, and through the example of our work together remind them that the interests of one community can only be served by also respecting and valuing the humanity and interests of all other communities. Jewish Council members include Rabbi Shlomo Amar - Chief Sephardic Rabbi of Israel, Rabbi Yonah Metzger - Chief Ashkenazi Rabbi of Israel, Rabbi Shear Yashuv Cohen - Chief Rabbi of Haifa, Rabbi David Rosen and Oded Wiener -- Director General of the Chief Rabbinate of Israel. Christian Council members include Patriarch Theophilos III - Greek Orthodox Patriarchate, Patriarch Michel Sabah, - Latin Patriarchate, Bishop Suheil Dawani - The Anglican Church in Jerusalem and the Middle East, Bishop Munib Younan - Evangelical Lutheran Church in the Holy Land and Jordan. Muslim Council members include Shaykh Tayseer Rajab Hamed Bayoud Tamimi - Supreme Judge of the Sharia Courts in the Palestine Department, Sheik Jamal Bawatnah - Minister of Awqaf, Salah Zuhayka - Assistant Secretary of the Waqf, Sheikh Hatem Hilmi Bakri and Sheikh Abdel Salam Mraish. Formed in 1984, Churches for Middle East Peace is a Washington-based program of the Alliance of Baptists, American Friends Service Committee, Antiochian Orthodox Archdiocese of America, Armenian Orthodox Church, Catholic Conference of Major Superiors of Men's Institutes, Christian Church (Disciples of Christ), Church of the Brethren, Church World Service, Episcopal Church, Evangelical Lutheran Church in America, Franciscan Friars OFM (English Speaking Conference, JPIC Council), Friends Committee on National Legislation, Greek Orthodox Archdiocese of America, Maryknoll Missioners, Mennonite Central Committee, Moravian Church in America, National Council of Churches, Presbyterian Church (USA), Reformed Church in America, Unitarian Universalist Association, United Church of Christ, and the United Methodist Church (GBCS & GBGM). Send a letter of protest condemning the decision of the Israeli government to begin withholding electricity, water and goods from the Gaza Strip. These actions are inhumane and illegal under international law. In a Cabinet decision announced September 18th, the Israeli government responded to ongoing rocket attacks from Hamas militants in Gaza into northern Israel by declaring all of Gaza a 'hostile territory'. This opens the door to cutting off all passage into Gaza and to halting the supply of services on which Gaza depends. An Israeli government official said, "We will reduce the amount of megawattage we provide to the Strip, and Hamas will have to decide whether to provide electricity to hospitals or weapons lathes." U.S. Secretary of State, Ms. Condoleezza Rice, refused to condemn the Israeli move, despite her pronouncement that the U.S. "will not abandon the innocent Palestinians in Gaza, and indeed will make every effort to deal with their humanitarian needs." Remind her that cutting the utilities to the whole civilian population in the Gaza Strip makes a mockery of her promise. Remind Israeli Prime Minister, Ehud Olmert, that these measures amount to collective punishment, and instead of making the citizens of southern Israel safer, will only increase the frequency of the firing of rockets from Gaza into Israel. Since 1948, the exodus of indigenous Christians [who are the descendants of first century Christians] has reduced their numbers from 20% of the total population of the Holy Land, to less than 1.3% since 1948. The reasons for the exodus of the most well educated and consistently nonviolent citizens, is due to the now 40 years of occupation, the lack of economic opportunities, The Wall which divides them from their land, resources, families and holy sites and the increasing sense of hopelessness that fuels militancy and the growth of fundamentalism within all three branches of Father Abraham's offspring's. These representatives have boldly condemned what happened in Gaza and are seeking dialogue, unity between Gaza and the West Bank, an end to the 40 years of occupation of Palestine and compassion and assistance to ease the suffering of innocent civilians, especially the ill, the weak, the poor, the children and the least in the West Bank and Gaza Strip. NOW is the time for every American Christian to connect with their sisters and brothers in the Holy Land, who are known as the "Forgotten Faithful" and for ALL thoughtful, concerned Americans to become an active participant in seeking Justice which will lead to security and peace in the Middle East. The only way to heal the Holy Land is by guaranteeing that all people do indeed have inalienable human rights as outlined in the UN Universal Declaration of Human Rights, which Israel agreed to uphold and was contingent upon their statehood. Diplomacy requires open dialogue and only justice will lead to security and peace. "Patriotism means to stand by the country. It does not mean to stand by the president or any other public official." The TOTAL 2005-2006 Election Cycle Congressional recipients of Arab American PAC Funds to Congress TOTALED: $80,500. $1,000 was received by 4 Congressional Reps. The violence and chaos in Gaza is cause for alarm and dismay for all those who yearn for peace in the Holy Land. The current crisis is bringing untold hardship to ordinary Gazans, threatens to spill over into the West Bank and Israel and jeopardizes progress toward a resolution of the Israeli-Palestinian conflict. The present situation underscores the urgent need for a political process that can restore hope for peace to Palestinians and Israelis. Below is a statement from the heads of churches in Jerusalem calling for an end to the fighting between Fatah and Hamas and urging all sides to work for peace and the establishment of an independent Palestinian state. Lutheran Bishop Dr. Munib Younan, in a separate statement, emphasized the need for urgent work on the peace process, "If you want to bring an end to the horrific violence in the Middle East and if you are concerned as I am by the rampant growth of religious extremism: please, I urge you from Jerusalem, get serious about implementing the two- state solution..."
On the recent 40th Anniversary of the Occupation we urged all sides to work for peace and the establishment of an independent Palestinian state. How painful and awful then that now we have to say stop all domestic fighting. The fighting has struck at the most vulnerable timing thus diverting International attention away from the National issue with its priorities and so disappointing the Palestinian people's hope of attaining independence together with freedom from Occupation with its related aspects. This domestic fighting where the brother draws his weapon in the face of his brother is detrimental to all the aspirations of achieving security and stability for the Palestinian People. In the name of the One and only God as well as in the name of each devastated Palestinian many of whom are still dying, we urge our brothers in Fateh and Hamas movements to listen to the voice of reason, truth and wisdom. So we implore that you immediately announce the cessation of all bloody fighting and to return back to the path of dialogue and attempt through understanding to solve all differences. In this urgent appeal we would draw attention to that which both parties have in common assuring them that it is greater that their differences. The national and land cause must be greater than any other consideration. In this belief we urgently ask both movements to listen and put aside all weapons so concentrating on ending the Occupation in a peaceful manner based on National fundamentals and International legitimacy in order to achieve freedom for all the people together with an independent Palestinian state with Jerusalem as its Capital. The beginning of June marks forty years since the 1967 War between Israel and the Arab states and the beginning of the occupation. The war and the ensuing occupation drastically altered the daily reality of the conflict while at the same time creating a mode by which it could be resolved through territorial compromise. The "land for peace" formula, enshrined in UN resolution 242, laid the groundwork for the two- state solution and is the basis of the recently re- launched Arab League Peace Initiative. However, four decades later, this peace has yet to be realized and the years of unresolved conflict have wreaked havoc on both Israelis and Palestinians and continue to damage a region that has failed to stabilize, to the detriment of all of its peoples and to the national security interests of the United States. The escalating violence in and around Gaza, with intra- Palestinian fighting, rocket attacks by Palestinian militant groups and Israeli military responses, is threatening to usher in yet another summer of war and only highlights the urgent need for a resolution of the conflict. Without a political context that includes a viable peace process, Palestinian factional hostilities, Israeli domestic politics, and the new spiraling violence in Gaza may overtake any possible progress. As we mark this 40th anniversary, now is a time to seize opportunities for moving forward. The end-game for Israeli- Palestinian peace is known: two states based on the 1967 borders, with a secure Israel living alongside a viable and contiguous Palestinian state and sharing the city of Jerusalem. The United States has a unique role to play in bringing the two parties together to work toward the goal of final status negotiations. The United States can help make the difference in this equation, aided by regional and other actors, by laying out a political horizon, a path for getting there, and committing itself to be a reliable participant in the process..."
As leaders of churches and Christian institutions in the United States, we bring you greetings for the New Year and encouragement as you meet the challenges that face our nation and the global community. Even though we are from a wide range of Christian traditions – Orthodox, Catholic, mainstream and evangelical Protestants – we stand close together in our hopes and prayers for peace in the land we all call Holy and for the reconciliation of the children of Abraham – Jews, Christians and Muslims. We come to you with two interrelated appeals that are central to our faith-motivated quest for peace with justice. First, we ask that you make Israeli- Palestinian peacemaking, in the context of a comprehensive Arab-Israeli peace initiative, an urgent priority for your Administration. We recognize the great many difficulties and struggles that the people of the Middle East region must confront and the heavy responsibilities that fall upon you to help restore hope for a better future for them and for the citizens of the United States. We know that many view the Israeli-Palestinian situation as the most intractable in our troubled world, but we know that when it is resolved, the positive repercussions will go well beyond that small geographic area. We commend your vision of a viable, contiguous Palestinian state living as a peaceful neighbor alongside the state of Israel, with both nations secure and recognized by their neighbors. With your active engagement, this vision could reignite a passion for peace that can overcome the appeal of violence, vengeance and exclusivity. The United States and the world will become safer as confidence grows that the U.S. is willing to take leadership and work cooperatively with the United Nations and other nations to resolve this conflict. We bring to you our deepening concern for the welfare and future of the Palestinian Christian community. A small but vital part of the Palestinian society, Christians are rapidly emigrating to countries where they can gain the economic and physical security that is denied all Palestinians living under occupation. The future of the Palestinian Christians requires a solution to the conflict that will allow both peoples – Israelis and Palestinians - to live side-by- side in two states where all enjoy justice, peace and security. The Palestinian Christian leaders have asked us to bring to your attention the very grave situation of Jerusalem. 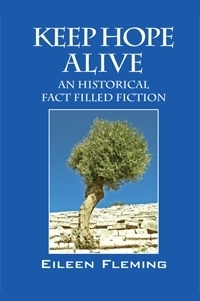 They remind us that Jerusalem is the location of “not only historical memories and sacred places of pilgrimage, but also living communities of believers.” With the construction by Israel of the separation barrier, many of the faithful – both Christians and Muslims – are excluded from the Holy City, and Jerusalem is severed from Bethlehem. Our second appeal is for you to work with Israelis, Palestinians and the international community to guarantee access to Jerusalem’s Holy Places and religious liberty for all peoples. Resolving the status of Jerusalem is key to achieving a workable two- state solution. Mr. President, as this New Year begins, we encourage you to maintain the faith, the courage and the resolve to work with other world leaders toward negotiations that guarantee two viable and secure states, Israel and Palestine, living side-by- side and sharing Jerusalem. For guidance we look to the examples of the great prophets Isaiah and Jeremiah who declared that God calls all nations and all people to do justice to one another. We join in praying for peace in the Holy Land and at home.